BitMedic Pro was designed specifically for the Mac, and offers a full suite of protection. 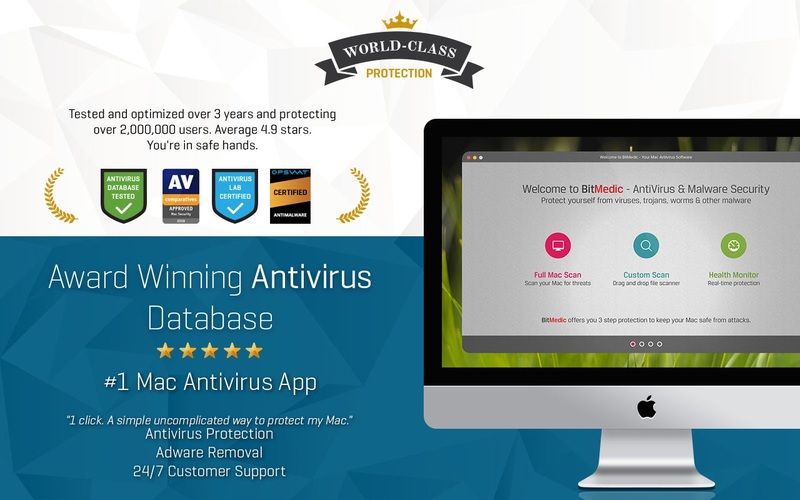 It gives you simple 3-step protection for the utmost security, keeping your Mac safe from attacks. Full Mac Scan – The Full Mac Scan offers 2 options. Quick Scan will quickly and efficiently scan the most critical locations of your Mac. Our proprietary algorithm makes this a painless and quick process, allowing you to conveniently scan your Mac more frequently. For maximum protection, deep scan will check every critical location for potential threats. Custom Scan – Custom Scan supports drag-and-drop for ease of use. Health Monitor – Health Monitor gives 24/7 real-time protection, scanning every change to the folders being monitored. Adware Scanner – Scan your Mac to remove adware. Remove adware browser add-ons that hijack your navigation – Advanced settings allow users to remove adware browser extensions and add-ons. Reset your web browsers to default settings – You can also reset your web browser back to its default settings. Know that adware and malware are different! You’ll need to use “Adware Scan” for adware and Quick/Deep scan for malware.